I wish I could say that we are farther along with the kitchen reno at the mountain cottage, but alas, I cannot. Mr. DIY is doing a fantastic job considering he's only spent a couple of weekends working on it this year. With me being sick and not being able to travel, plus he was working on our house trying to get it ready to sell this summer. We decided that's not going to happen this year, so we turned our attention back to the mountain cottage and figured we could spend some time there while the weather is good and then when it gets cold again, we could finish up our house for next Spring. 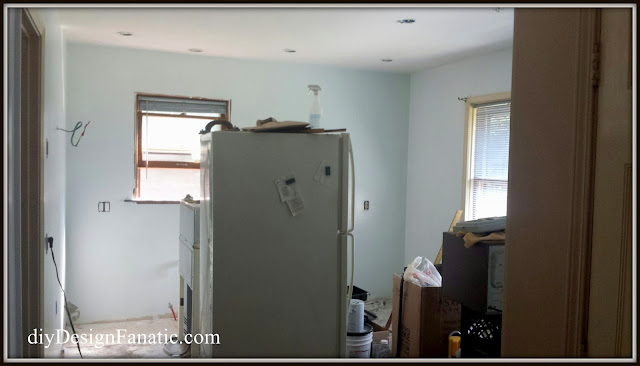 I've made a lot of progress and am a lot better, but I still wouldn't be able to get the house ready to show even if the house was ready to put on the market. Let's go back to where we started...You won't hurt my feelings if you tell me the kitchen at the Mountain Cottage was UG-LY. Seriously, have you ever seen a kitchen in need of more help? Here's the plan that was done for us where we purchased our cabinets. Mr. DIY is going to build some open shelving and a custom stained wood hood on the stove side. We were all set to demo the kitchen when I realized that the closet in the kitchen(long story) would make a great pantry. So we took a couple of months to build a custom Vintage Style Pantry. I'm so glad we built this before we got started because it holds a lot. We are using a low, wide dresser in the living room for our counter and prep area. 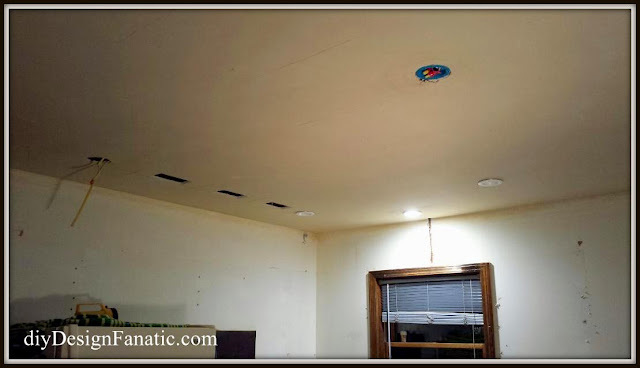 Once Mr. DIY got started, he had quite a job wiring for all the electrical and installed quite a few can lights. I don't know how the previous owners were able to see in the kitchen as it was really dark and only had 2 lights. 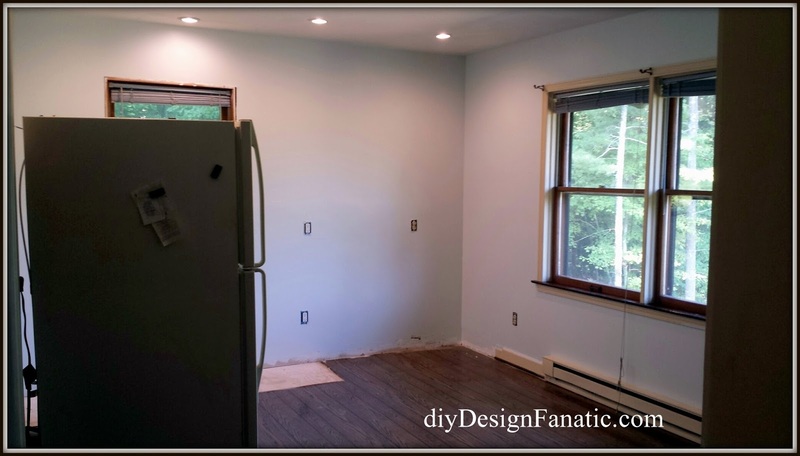 A couple of weekends ago, Mr. DIY came up by himself because the lawn hadn't been mowed in awhile and he painted the entire room a light blue. It's going to look great with the white cabinets. The paint color is Topsail from Sherwin Williams. I'm so proud of myself because it was the first and only sample that I purchased! After he painted, he cleaned up the entire kitchen and came home. I really have a patient husband because he was all set to install cabinets, when I decided our Cottage Kitchen should have a plank ceiling. It took us about two weeks of priming and painting the boards at home to finish up. He made a special trip to the house to bring the boards up so that they'd have time to acclimate inside the house before he starts installing them tomorrow. And that's how far along we are with the kitchen reno. One thing being sick has taught me is that it will get done, when it gets done, but I still am looking forward to getting those cabinets in! This is my first time here since May and the weather is really nice. Hi Pam. I'm glad to see you're feeling up to blogging again. We're wanting to replace our cabinets, but feel frustrated with either paying $12k for non-custom for our 8 x 13 kitchen or buying ugly solid particle board cabinets at the big box home stores. I see kitchen remodels on HGTV with only $3k spent on cabinets. Unfortunately, there is no reference in the credits or online. Another option is IKEA where I can find the cookie-cutter, everyone has these.cabinets. Do you have any suggestions? We looked into RTA to save money, but even those are $8k for solid particle board, made in China cabinets. We purchased ours at Lowe's and they were still expensive even though they are particle board. 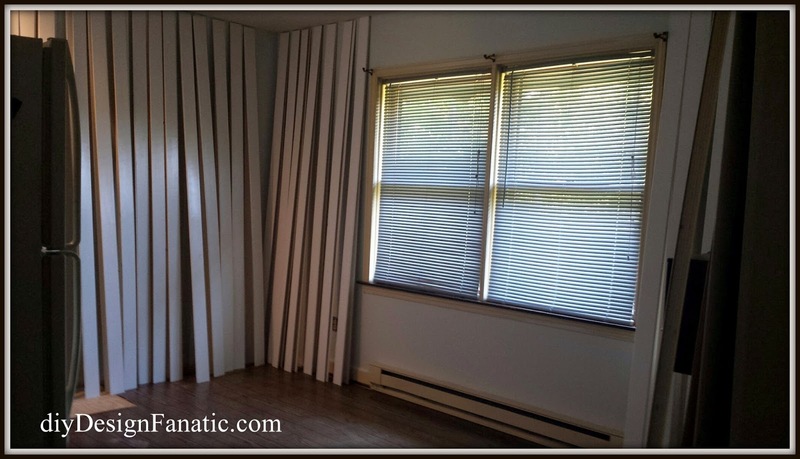 We purchased Kraftmaid cabinetry. I would definitely stay away from anything made in China. There are some smaller companies such as Wellborn Cabinetry that have a less expensive line. Wellborn has the Select line which is less expensive, but the doorstyles available are limited. They have a plywood option. Wellborn cabinets are made well and made in America and are a green company. They are a green company out of saving money as they have their own trees, cut and mill their own lumber and make their own doors. I used to sell all the lines from Wellborn Cabinetry and have been to their manufacturing plant in Alabama. I would have used Wellborn at our mountain cottage, but Lowes/Kraftmaid was having a sale at the time and Kraftmaid is a good line too. (I've sold this line before, as well. I also wanted a specific tall slide out pantry cabinet ($$$) that only Kraftmaid had as our kitchen is so small and I needed a slide out pantry in that spot. Wow Pam your hubby is the best! I feel so bad for you being set back with this illness. I do like the new paint color and the idea for the ceiling. It's going to look quite perfect for your cabin. My Dad always said "all good things come to pass" and I know you will get this done before long and be able to enjoy it. Keep hanging in there kiddo and you'll see this through! Yes indeed, your husband is the best! But I feel so badly for you. I'm glad you're better…but that's not the same as fine. But you are so right: it will get done when it gets done. And thank you for the info above about cabinet makers. 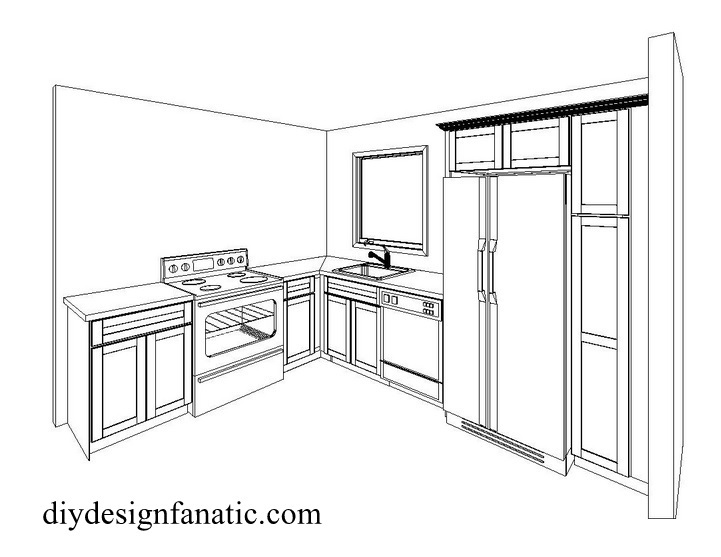 I may look to replace doors on our kitchen cabinets, and yes, custom is just too $$. Oh wow, it is going to be fabulous. Hope you're feeling better soon.